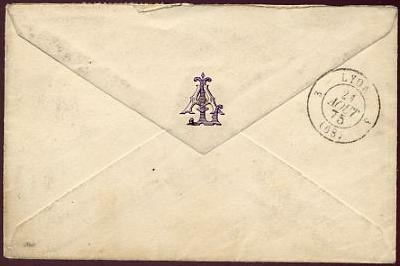 This cover went into the mails in the French Post Office in Alexandria. a Gros Chiffres (large numbers) 5080 in a lozenge of dots. Numbers greater than 5000 were assigned to Algeria and French offices abroad. In addition, there the cover was marked with a red boxed PD (indicating paid to destination). and an 1875 80c. rose on pinkish paper Ceres stamps (Scott 59 and 63, respectively). which was the fastest service from Suez to Europe. The packet could meet a train there for the continental trip and avoid the long voyage to Marseilles. The red CDS is supposed to be a Paquebot Angl. Alexandria. It's not legible enough for me to tell although the date appears to be August 21. That doesn't seem to match its arrival in Lyon. Is it perhaps a marking applied en route from Alexandria to Brindisi? 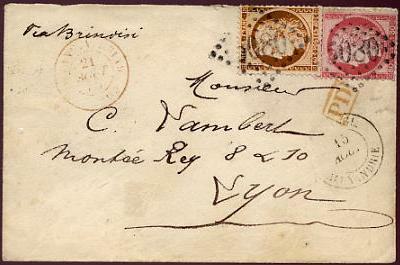 The cover arrived in its destination, Lyon, on August 24. Lyon is about 150 km north of Marseilles. Note the interesting monogram on the flap.